England Traffic News. Our England traffic reports section is dedicated to the latest traffic reports and traffic updates for England. Details of roadworks around England covering all the major motorways and "A" roads in England. The traffic news for England is updated by the minute. We are now beta testing our brand new Traffic News England webiste dedicated to traffic news from around England. Check it out! The aim is simple to help our users avoid traffic jams in England easily and quickly. UK Traffic News features traffic news, traffic updates and traffic reports from the main roads and motorways and "A" roads around England. Below are some of the the latest up to the minute traffic reports and traffic news for England. You can find ALL current traffic news for England, accidents and roadworks using the search facilty to the right. Use the links above to view dedicated pages with all the latest news from other motorways and regions. Please allow a few seconds for the latest news and updates for England to load. Location : The A50 westbound between the A518 and the junction with the A522 . Reason : Congestion. Status : Currently Active. Return To Normal : Normal traffic conditions are expected between 23:15 and 23:30 on 23 April 2019. Delay : There are currently delays of 10 minutes against expected traffic. Location : The A50 eastbound between the junctions with the M1 and the A453 . Reason : Roadworks. Status : Currently Active. Period : from 23:16 on 23 April 2019 to 06:00 on 24 April 2019. Lanes Closed : All lanes are closed. Location : The M1 northbound between junctions J10 and J11 . Reason : Congestion. Status : Currently Active. Return To Normal : Normal traffic conditions are expected between 23:30 and 23:45 on 23 April 2019. Delay : There are currently delays of 15 minutes against expected traffic. Location : The M6 northbound between junctions J21 and J21A . Reason : Congestion. Status : Currently Active. Return To Normal : Normal traffic conditions are expected between 23:00 and 23:15 on 23 April 2019. Delay : There are currently delays of 10 minutes against expected traffic. Location : The A12 northbound exit slip to the A130 . Reason : Congestion. Status : Currently Active. Return To Normal : Normal traffic conditions are expected between 23:00 and 23:15 on 23 April 2019. Delay : There are currently delays of 10 minutes against expected traffic. Location : The M11 southbound exit slip at junction J7 . Reason : Congestion. Status : Currently Active. Return To Normal : Normal traffic conditions are expected between 23:15 and 23:30 on 23 April 2019. Delay : There are currently delays of 10 minutes against expected traffic. Location : The M1 southbound at junction J23 . Reason : Congestion. Status : Currently Active. Return To Normal : Normal traffic conditions are expected between 23:15 and 23:30 on 23 April 2019. Delay : There are currently delays of 10 minutes against expected traffic. Location : The M6 southbound at junction J11A . Reason : Congestion. Status : Currently Active. Return To Normal : Normal traffic conditions are expected between 23:15 and 23:30 on 23 April 2019. Delay : There are currently delays of 10 minutes against expected traffic. Location : The A404 southbound at the junction with the M40 . Reason : Congestion. Status : Currently Active. Return To Normal : Normal traffic conditions are expected between 23:15 and 23:30 on 23 April 2019. Location : The A1 northbound between the A428 and the junction with the A14 . Reason : Roadworks. Status : Currently Active. Period : from 22:55 on 23 April 2019 to 06:00 on 24 April 2019. Lanes Closed : All lanes are closed. 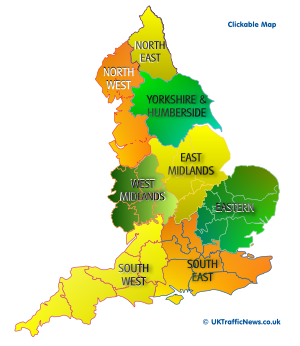 England consists of the counties of all the counties in England. Some of the primary towns in England include, London, Manchester. Liverpool, Birmingham, Leeds, Plymouth, Norwich, Cambridge, Peterborough, Ipswich, and Chelmsford. Bringing you the latest England traffic news, traffic reports and traffic updates for England. Search for all England traffic news and traffic reports using the search box above. Use keyword specific terms for England such as "M11 northbound" or "M25 westbound", A1(M). If you are looking for traffic reports for particular road in eastern England type the name of the road e.g "A1", A10, A14, A47. Give it a try easy to find traffic reports and traffic news for the M4. We feature the latest Eastern England traffic news to help you avoid traffic jams in the east, delays and accidents or hold-ups. Saving fuel, stress and time for your journey around East Anglain and eastern England. The aim of our Eastern England traffic news page is to bring you quicky and easily the latest traffic reports for the East. Travelling? For Camping holidays find Campsites | Days Out at Wildlife Parks avoiding the traffic!